More Oil. More Flavor. More Demand. Farm The Soil To Thrive. This information is based on the results of our 2017 and 2018 U.S. Hemp field trials. Individual results may vary depending on plant genetics, soil physics and environmental factors. "Amazing product!! Instant and undeniable positive results! Strong root growth all around with terpene profiles of each phenotype enhancing tremendously. Easily able to feed 10 acres of hemp through dripline with this water soluble powder. It actually cleaned clogged lines do to bacteria growth!!! Will be using this product for my 2019 industrial hemp season." "My extractor was quite surprised at the terpene amounts which he fractioned off before decarbox and winterizing. I am certain that the benefits were well worth our use of Soil Balance Pro. I would look forward to beginning to use it earlier in the beginning of bloom." "We here at Gold Bar Farms, LLC are happy to say we will be using Soil Balance Pro in all our fields for the 2019 season." "Fantastic results! Soil Balance will certainly be a necessary ingredient for my farms in the future. Thank you to all involved in the process of bringing these organisms together. I can’t wait till next year!" "The plant getting SoilBalance produced 27.95% bigger dry yield than the plant that didn’t get SoilBalance. Great product, and I’m a customer for life." "Effective - easy to apply"
"Best microbes on the market!" "This product has made my soil supercharged! The health of my plants is amazing. I am getting hydro like yields in soil with this stuff. A little goes a long way. Make sure you have adequate carbo sources for maximum potential." "Love it! It’s never coming out of the rotation." "This is a great product! I have a high-powered microscope can definitely see the difference in quantity and diversity of microbes." "Best stuff I ever used. A must try. You won't be let down by this product"
"we noticed an improvement within a couple days of starting to use soil balance. we have now decided to use it weekly, as directed. Great product, my plants are very happy about it. Ty!!!" "I don't write reviews often but from what I know about this company like. From what I've read I like what they're about and their product seems to be of quality and is reasonably priced. Not too many companies out there like this these days but this seems to be one of the good ones along with Scott and the crew from Nectar for the gods." The following calculator uses a 20% increase in Total CBD oil content per pound of flower for growers averaging 4 to 15% CBD levels. If your CBD levels fall outside of this range please contact us for an estimate. If you grow acres of hemp at a density of plants per acre, yielding pounds per plant, and sell it for $ a pound, you stand to make $ more in gross revenue using Soil Balance Pro due to the increase in production of oil and terpenes. All fields must contain a numeric value greater than 0. * These calculations use the full MSRP price and the recommended application rate of 3 applications per acre. This information is based on our 2017 and 2018 U.S. Hemp trial results. Individual results may vary depending on your soil physics and environment. Your gross revenue is an estimate based on the data that you provide. A root microorganism called Streptomycetes creates enzymes that signal the hemp plant to increase CBD+CBDa oil production. Soil Balance Pro contains 62 microbe strains. This specific combination stimulates the CBDa-Synthase enzyme by signaling the plant to achieve its maximum and truest genetic expression. The microbes in Soil Balance Pro have been carefully selected for their unique ability to supplement the cannabis plant's production of necessary precursors to cannabinoid formation. ONLY genetic encoding can dictate which particular cannabinoids the plant allocates these precursors to, and in what ratios. However, Soil Balance Pro has shown to consistently reduce certain types of "stress induced" THC production. "Stress induced" THC production is NOT genetically encoded, rather triggered by stress induced genetic misprints. These misprints have the ability to skew CBD:THC ratios in a compiled negative manner for hemp farmers. It is still the responsibility of the farmer to regularly monitor and maintain THC limits imposed by their governing body. Petiole samples taken from plants in NC, processed independently by NCDA (North Carolina Department of Agriculture). 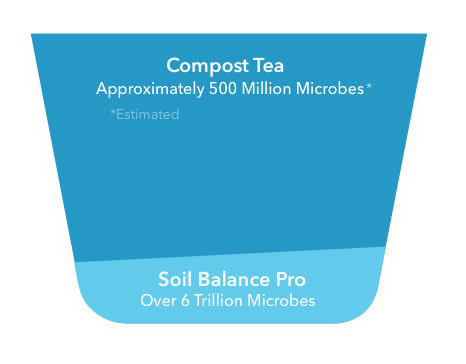 It would take 12,000,000 gallons of compost tea to equal the microbes in a 1 acre application of Soil Balance Pro. Three to four years of the correct inputs, such as compost, minerals and compost tea, can help regenerate the soils biological activity which is vital to oil production. Soil Balance Pro allows growers to circumvent this three to four year timeframe by providing the correct microbial life the hemp plant needs, at ratios designed to work. The art of regenerative and sustainable agriculture is not found in a product, it is a mindset. By farming the soil, the life you provide to it will equal the life you and others will receive from it. Soil Balance Pro has been created to serve the stewards and protectors of our lands and plants. All life and human sustainability is intimately connected to your work. Soil Balance Pro is a tool designed to support and leverage that mission. We encourage you to connect with one of our consultants to guarantee availability and reserve Soil Balance Pro for your operation today. Visit our online store at SoilBalancePro.com/Buy or reach out to us directly using one of the methods below. Thank you for your work.